The unique design of the windows on the Church of Saint Andrew and Saint David in downtown Saint John in New Brunswick, Canada. 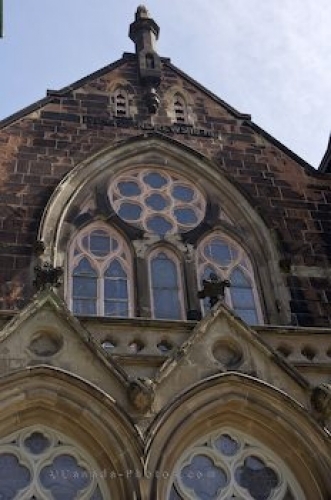 The windows on the Church of Saint Andrew and Saint David in Saint John, New Brunswick are a combination of the two churches when they joined together to become one. The windows on the Church of Saint Andrew were taken out to be reinistalled in Saint David and are on display at the back of the church while the ones on the facade are the originals. Church of Saint Andrew and Saint David - United Church of Canada in downtown Saint John, Bay of Fundy, Fundy Coastal Drive, Highway 1, New Brunswick, Canada. Photo of the windows on the Church of Saint Andrew and Saint David in New Brunwick.